Photos by Michelle Davies | The Journal Gazette Carroll High School freshman Isabella Errington, 15, recently received two recognitions for volunteerism, including the President's Volunteer Service Award. “I‘ve always loved making a difference,” says Errington, who also was named a distinguished finalist for the Prudential Spirit of Community Awards. 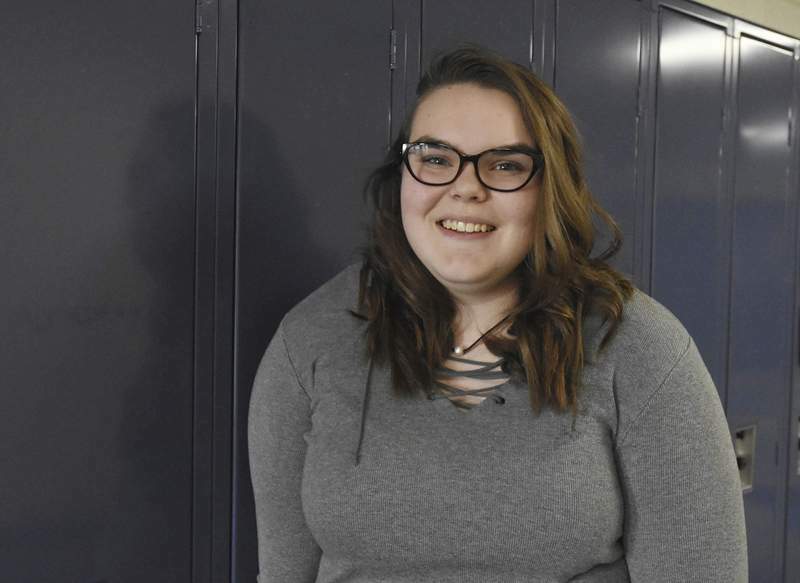 Isabella Errington isn't one to seek the spotlight, but her passion for volunteering is getting the Carroll High School freshman noticed. She recently received two awards for her volunteerism, including the President's Volunteer Service Award. “I've always loved making a difference,” Errington said. Parkview Family YMCA also nominated her for the 2019 Prudential Spirit of Community Awards, a nationwide program honoring youth for outstanding acts of volunteerism. 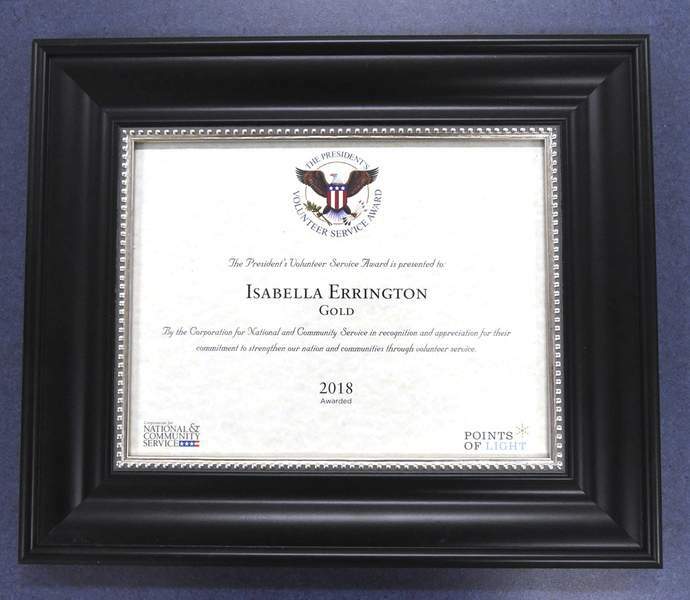 While Errington wasn't named one of Indiana's top two youth volunteers, she was recognized as a distinguished finalist, an honor that comes with an engraved bronze medallion. The recognition took Errington by surprise, especially because the dean of students pulled her out of class to tell her – a move that led Errington to believe she was in trouble. Errington's volunteerism has taken her various places, including an animal shelter, Turnstone and a retirement home, where she painted a resident's nails with glittery polish and got a smile of “pure joy” in return, she said. People shouldn't underestimate what youths can accomplish, she said. • Ivy Tech Community College will host Express Enrollment Day from 9 a.m. to 6 p.m. Tuesday and Wednesday at its Student Life Center in Fort Wayne, 3701 Dean Drive, and its Warsaw site, 2545 Silveus Crossing. Go to www.ivytech.edu/EEDay for more information. Most summer classes begin June 10 and fall classes begin Aug. 26. • Indiana Tech's Tech Talks series is shedding light on the opioid crisis with free public events. A showing of “Ben is Back” – a 2018 drama about the effects of drug addiction on a family – is 7 p.m. Wednesday at Magee-O'Connor Theater. A discussion will follow. • A free viewing of the documentary “What is Philanthropy?” is 7 p.m. Wednesday at Fabiani Theatre in the Rick L. and Vicki L. University Center on Trine University's Angola campus. A question-and-answer session with filmmaker Salvatore Alaimo will follow. • Laurie Sperry and Katherine Wells will be keynote speakers at an autism symposium presented by the University of Saint Francis and AWS Foundation. People wanting to know more about autism and how to support students and adults with Autism Spectrum Disorder may attend. Hours are 9 a.m. to 3 p.m. April 10 for teachers, counselors and interventionists; 5:30 to 7:30 p.m. April 10 for community leaders, businesses, agencies and parents; and 9:30 to 11:30 a.m. April 11 for school administrators and support personnel. Sessions will be held the USF Robert Goldstine Performing Arts Center, 431 W. Berry St.
Go to autismsymposium2019.eventbrite.com to register. Contact Angie Springer at 260-399-7700, ext. 8100, or aspringer@sf.edu for more information. • Michael and Rebecca Kubacki are partnering with Ivy Tech Community College in Fort Wayne and Warsaw to fund a scholarship aimed at Kosciusko County residents with Latino heritage. The recipient will receive $5,000 for one year and $5,000 in the second year if the student remains in good standing. Go to http://bit.ly/ivytech-kubacki to apply. The deadline is April 1. • Schools and parents have through April 5 to apply for grants from Action for Healthy Kids. Grants available for the upcoming academic year support nutrition, fitness and school breakfast programs. Go to www.actionforhealthykids.org/grants for more information. • Homestead High School's radio station, The Point 91.1 FM, finished as Radio School of the Year at the annual Indiana Association of School Broadcasters awards ceremony. It is the program's third consecutive state championship. These students also earned these placements in various categories: Cory Balkenbusch, first and second; Matt Saalfrank, first and honorable mention; Christina Kruger, first, second and honorable mention; Ellie Davis, second; Jessica Walter, second; Drew Persinger, second; John Lane, second; Donnie Harmon, third and honorable mention; Easton Hensley, third; Tyler Veit, third; Carson Clymer, honorable mention; Abigail Boylan, honorable mention; and Catherine Kruger, honorable mention. In the television category, Derek Hockemeyer took home second place and “HHS In Depth” earned honorable mention for school newscast. • Southwest Montessori Academy is launching a feasibility study to grow the school. The Dekko Foundation awarded it a grant to engage in a study of a capital campaign of $70,000. The at-capacity school is seeking to expand to accommodate 81 more students. • Registration is open for summer courses at Trine University. Classes are available to students from any college at a reduced tuition rate. Six-week classes run from May 13 to June 20 and June 24 to Aug. 3. Twelve-week classes run from May 13 to Aug. 3. For more information, go to www.trine.edu/getahead or contact Andrea Mofield at 260-665-4813 or mofielda@trine.edu. • Warsaw Community Schools' dual-language immersion programs will use a lottery admission system for the kindergarten level for the upcoming academic year. Applications are available at Leesburg or Eisenhower elementary schools. The deadline to enroll in the lottery is Friday. The drawing is set for April 12.